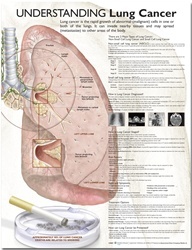 Understanding Lung Cancer Anatomical Chart defines lung cancer and the two main types: non-small cell lung cancer (NSCLC) and small cell lung cancer (SCLC). The main lung image shows metastasis to paratracheal lymph nodes, metastasis to carinal lymph nodes, and a close-up image of a tumor projecting into bronchi. 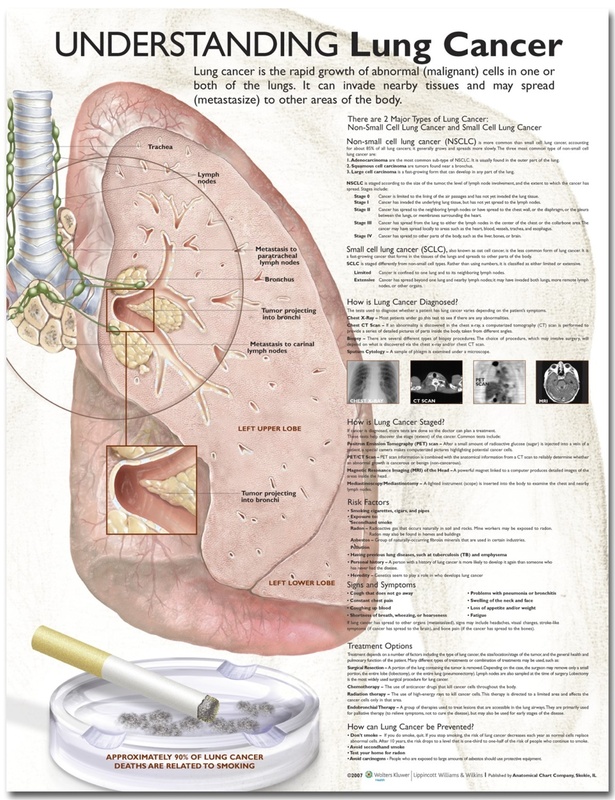 The chart describes how lung cancer is diagnosed and staged and has images of chest x-ray, CT scan, PET scan, and MRI. It lists risk factors, signs and symptoms, and treatment options. It also describes how lung cancer can be prevented and shows an image of a cigarette in ashtray with the statistic that approximately 90 per cent of lung cancer deaths are related to smoking.